Wellington boots are a marvel – I would say a necessity for anyone living in the country… I would be lost without my blue Hunters. However, off your feet and just lying around – they are a complete pest! Having discovered a metal boot rack that is compact,holds the family’s collection of wellies AND looks good, I am now in heaven! We have tried all sorts of ideas in our house, to get a grip on “the wellingon boot problem” – wooden pegs outside but the boots get so cold; a dedicated space in the utility room for them to stand up, but remove one pair and they all fall down; and the new wellington boot clips that cover the tops of your wellies, but they don’t work well with Hunters and they still fall over. Use inside or outside – we prefer inside by the back door as then your boots stay warm too. Brilliantly compact: you can store up to 5 pairs of boots on minimal floor space with this particular range of metal boot racks. 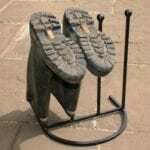 Tidy: at long last our boots stay put when not in use! They also look fabuous – a nice rustic, wrought iron look and they are heavy. You won’t knock them over easily and even with a collection of adult and child wellies, they don’t topple over or become unbalanced. There are a variety of sizes, from two to five pairs of wellies and there are also a handy boot pull, in the novel shape of a foot, and a boot scraper, that sits outside and you can use to scrape off the worst of the mud or as an alternative means to yank off your boots.